Dance like crazy, nod your head and rock out to the intoxicating sounds of Bloc Party swimming through your speakers. On the surface, the British alt. rock band sets themselves apart from most, as their sophomore album is just as good,, if not better than, their debut album. Layered with profound yet chaotic tones about rebellion, sexuality (homo and hetero), addiction, racism, religion and terrorism, the band seeks to reveal the disjointed place one calls the city. The album, A Weekend in the City, is just that. 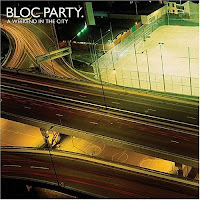 Those unmistakable vocals of Bloc Party bring a complex dynamic to the table as they make it impossible not to feel the strains of frustration; but yet, the hopes of redemption that are found in the depths of relationships. The feelings of discontentment are evident in their portrayal of this so called life we live in. “Drink to forget your blues on the weekend/Think about more things to buy/The TV taught me how to sulk and love nothing/And how to grow my hair long.” Mixing heavy with some mellow tones, accompanied with great drum beats, guitars and unique vocals pretty much sums it all up. The music is intense, mixing heavy and mellow tones with great drum beats, guitars and unique vocals. So, go ahead, it’s your turn to listen. This entry was posted on February 21, 2007 at 4:55 pm and is filed under bloc party, kll, music, number seventeen. You can follow any responses to this entry through the RSS 2.0 feed. You can leave a response, or trackback from your own site.